Have a sweet treat with Minnie! Use our Minnie Mouse Birthday Cupcake Stand to display cupcakes, appetizers and more! 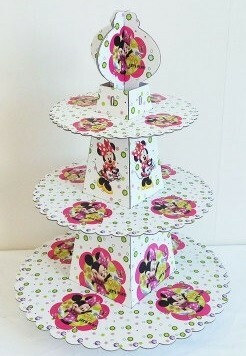 Minnie Mouse Cupcake Stand measures 12in x 12in x 15 3/4in and features a three-tiered stand in pink and Minnie printed. Stand is made of sturdy cardboard and features a Minnie topper. Stand comes flat and ready for easy assembly.